“Let’s get lost together . 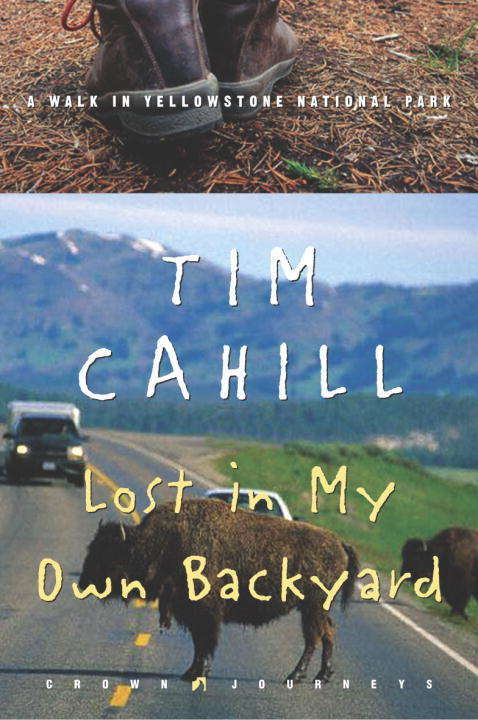 . . ” Lost in My Own Backyard brings acclaimed author Tim Cahill together with one of his—and America’s—favorite destinations: Yellowstone, the world’s first national park. Cahill has been “puttering around in the park” for a quarter of a century, slowly covering its vast scope and exploring its remote backwoods. So does this mean that he knows what he’s doing? Hardly. “I live fifty miles from the park,” says Cahill, “but proximity does not guarantee competence. I’ve spent entire afternoons not knowing exactly where I was, which is to say, I was lost in my own backyard. ” Cahill stumbles from glacier to geyser, encounters wildlife (some of it, like bisons, weighing in the neighborhood of a ton), muses on the microbiology of thermal pools, gets spooked in the mysterious Hoodoos, sees moonbows arcing across waterfalls at midnight, and generally has a fine old time walking several hundred miles while contemplating the concept and value of wilderness. Mostly, Cahill says, “I have resisted the urge to commit philosophy. This is difficult to do when you’re alone, twenty miles from the nearest road, and you’ve just found a grizzly bear track the size of a pizza. ” Divided into three parts—“The Trails,” which offers a variety of favorite day hikes; “In the Backcountry,” which explores three great backcountry trails very much off the beaten track; and “A Selected Yellowstone Bookshelf,” an annotated bibliography of his favorite books on the park—this is a hilarious, informative, and perfect guide for Yellowstone veterans and first-timers alike. Lost in My Own Backyard is adventure writing at its very best. From the Hardcover edition.